Gujarati snacks are unique. There are so many snacks or nashta as its called that I don’t think any other state has that many. Dhokras, fafdas, handvo, muthia, mathia, ganthia, kakras, dhebras, theplas, the list is endless. There is definitely more to Gujaratis than just dhokras. I love gujarati snacks. The variations of these snacks within Gujarat too are endless. One of my family’s favourite snack is dangella. 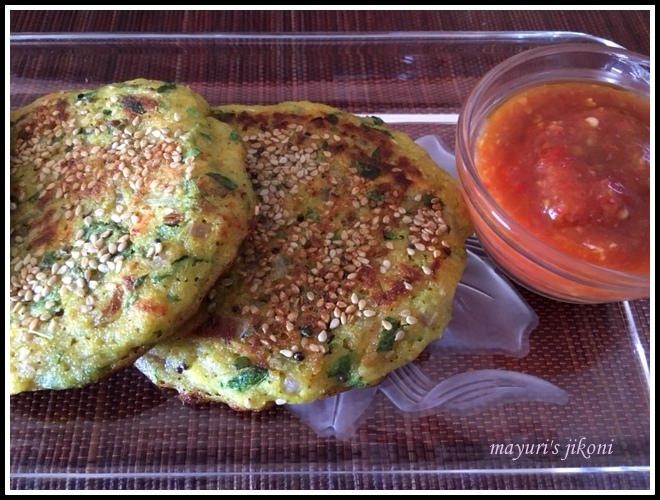 Its a gujarati version of the uttapam from the south, but tastes totally different.We normally have this for dinner or as a light lunch. Don’t get put off by the long list of ingredients. Most of them are easily available in most Indian homes or the Indian stores. My mum would make these sometimes instead of handvo. Its a delicious snack to put in a tiffin box or even for picnics. You can add grated zucchini instead of doodhi. I make small ones too often. Soak the rice and dal in warm water for 6 hours. Drain out the water. Wash the rice and dal separately. Grind both coarsely but separately in a food processor or a liquidiser. If you are using a liquidiser then use the yogurt and water to liquidise. Mix the rice and dal. The batter should not be runny at all. Add turmeric powder, ¼ tsp fenugreek seeds,chilli and ginger paste.Cover and leave the batter in a warm place for 6 to 8 hours. Add the grated carrot, doodhi, onion, fresh fenugreek, salt, sugar, cinnamon and clove powder to the batter and mix well. Heat the oil in a small pan. When it is hot add the cumin, mustard, fenugreek and carom seeds. Add asafoetida and immediately pour it over the batter. Mix well. Add soda bicarbonate just before you start preparing the dangella. Heat a frying pan over medium heat. When it is hot, add a tbsp of oil and pour ladleful and a half of the batter.Spread out gently. Sprinkle about a tsp of sesame seeds on top. Cover the pan, and cook the dangella over low heat. When one side is done, flip and add again a tbsp of oil and let the other side cook. Both sides should be slightly crispy and done. Usually each side takes about 5 minutes. Repeat with the remaining batter. You can make the size of the dangella as you wish. Serve immediately with hot sweet masala tea or a glass of milk. I usually put the batter in the oven as this helps it to ferment. The fenugreek seeds too help it to ferment. You can use ready made handvo flour for this recipe. Just soak the flour using enough warm water, sour yogurt and fenugreek seeds and let it ferment overnight.Then follow step 6 onwards. Can use grated cabbage instead of doodhi. Any leftover batter can be stored in the freezer. Make tiny rounds to serve at a tea party or as finger food. If your batter becomes runny, then add semolina (sooji) to get the right consistency. It should be of dropping and not running consistency. Don’t have fresh fenugreek then use fresh coriander or palak. Tastes good even when they are cold. So its a perfect snack for guests. For some reason, I cant comment on all of your posts Mayuri. Its just not showing me the Comment box, I was only randomly surfing through your recipes when checked at this post, and I could comment. Have you had this issue with some other blogger too, or is it just me ?